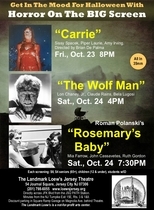 Landmark Loew's Jersey theater in Jersey City, NJ has some exciting screenings lined up for this coming weekend, starting October 23rd at 8:00PM with a 35mm print of Brian DePalma's Carrie and continuing October 24th with a showing of George Waggner's The Wolf Man at 4:00PM and then Roman Polanski's Rosemary's Baby at 7:30PM. Tickets are $6 per screening ($4 for seniors age 65 and older), but combo packages are available for those who want to take in multiple films. 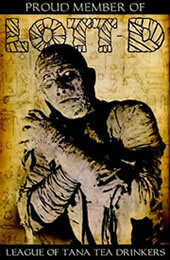 More details can be found at the Landmark Loew's Jersey webpage.